"Icarus at the Edge of Time" performed at the City Bank Auditorium. The Greek myth about Icarus, a young man imprisoned in a tower with his father, ends when he ignores his father's warning and flies too close to the sun, melting his wax wings and plummeting into the ocean to his death. That ending never sat well with Brian Greene. “If you want to do anything original, if you want to do anything ultimately great, you've got to go against what happened before,” the internationally renowned physicist told an audience of thousands of teenagers Wednesday (Feb. 4) at Texas Tech University. Greene reworked the ancient myth, producing “Icarus at the Edge of Time,” a multimedia performance that tells the story of a young man who lives on a spaceship. One day, determined to do something bigger than the confines of the ship, he flies a small craft to the edge of a black hole. He makes history – then finds himself a part of history when he discovers the gravity surrounding the black hole caused time to slow down. What seems like an hour to him was 10,000 years. 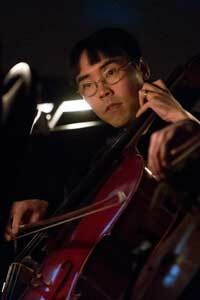 On Wednesday, about 3,500 area middle and high school students came to the City Bank Auditorium for two performances, which included a full orchestra directed by music professor Keith Dye performing a score from Oscar-nominated composer Philip Glass. Greene narrated as a film followed the story of young Icarus. It leaves a much different message than the original phymyth, acknowledging that discovering something new about the universe can give an explorer new and uncomfortable perspectives, even causing grief over the loss of what was, while reminding viewers that pushing the boundaries of what is known is necessary to discovery. Texas Tech President M. Duane Nellis and Provost Lawrence Schovanec welcomed the students to the first performance of the unique collaboration, which the College of Education, College of Visual and Performing Arts and Whitacre College of Engineering co-sponsored. “My wish for today is that, like the modern-day Icarus of Dr. Greene's story, you will be inspired to take daring journeys in your life,” Schovanec said. 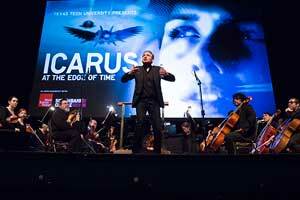 Greene, a physics professor at Columbia University, wrote “Icarus” with a multimedia performance in mind. His book publisher suggested turning the narration into a book. The idea, he said, is to make science understandable and interesting. Many people write it off as too hard, but with “Icarus” it is combined with music and art and suddenly becomes more approachable. “The most exciting thing is when you see the music affect the story, the story affect the film, the film affect the music,” Greene said. He is working on a sequel to “Icarus,” which will premier in New York City in December. He'll answer the big question the viewer is left with at the end of the first book – what happens to Icarus? – but declined to give away the ending. The two stories will then be performed as two acts in the same play. He thinks of these stories not as science fiction, but as science in fiction. “This is how the world actually works,” Greene said. For more information on “Icarus,” watch the trailer, read a review or go to Brian Greene's website. 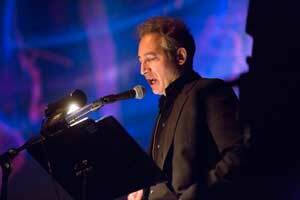 Brian Greene is a world-famous theoretical physicist who teaches at Columbia University. He is the co-founder of the World Science Festival in New York City and has written numerous nationally best-selling books, including “The Fabric of the Cosmos” and “The Elegant Universe.” He has been interviewed on “The Colbert Report” and the “Late Show With David Letterman” and discussed his book “The Hidden Reality” during a cameo on “The Big Bang Theory.” He earned his undergraduate degree from Harvard and his doctorate from Oxford University, where he was a Rhodes Scholar.